The WJ2010.BA0591 TAG Heuer Link Calibre 7 GMT Magnetic Bezel Men’s Watch is part of the latest additions to the Link line, and was recently debuted at the Basel Fair in Switzerland. This unique and innovative GMT watch is not yet available to the public, and is sure to please many world travelers when it is released in the Spring of 2010. 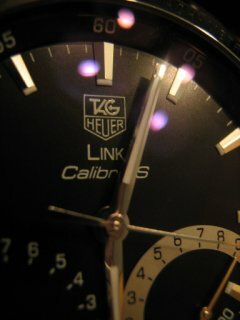 The TAG Heuer Link Calibre 7 GMT is the only 24 city GMT watch that has an instant-adjust feature. It has a patented magnetic bezel system that allows wearers to adjust the city simply by turning the bezel. This radically simplifies the process. Hidden under the 10 o’clock position is a button that allows wearers to easily reset the GMT function. All of the hands on the watch are luminescent, and the minute and hour hands are plated in polished Rhodium. Each hand-applied index is curved and faceted. There is also a date window at the 3 o’clock position that is diamonded. The Link Calibre 7 GMT is housed in a fine-brushed stainless steel case. The curved crystal is made from scratch-resistant sapphire and is treated on both sides with an anti-reflective coating. It also has a sapphire crystal case back. The bezel is made from polished stainless steel, as is the screw-in crown. The watch is water resistant to 200 meters. Anyone know how to address the timezone issue between Halifax and Dubai on the link calibre Gmt watch? Currently the bezel and Gmt function displays the two cities as two different timezones and they are the same. This results in the wrong time for the everything west of LA.